The Warner Robins Police Department says the break has been contained to people in Huntington Chase. 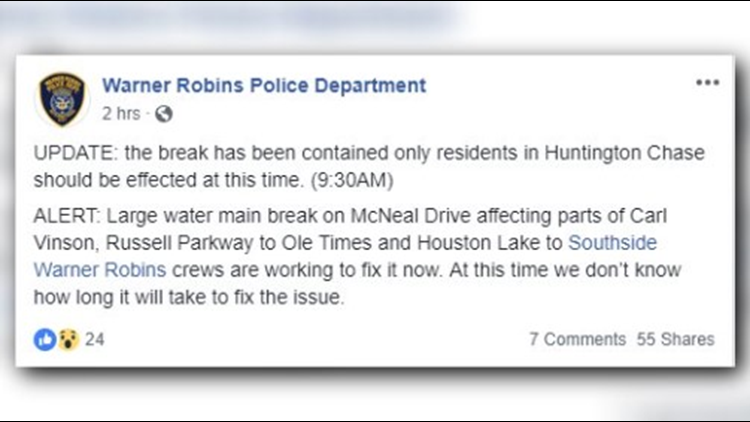 WARNER ROBINS, Ga. — A large water main broke on McNeal Drive in Warner Robins on Sunday. That's according to a post on the Warner Robins Police Department Facebook page. The post says the break was affecting parts of Carl Vinson Parkway, Russell Parkway to Ole Times and Houston Lake Road to Southside, but has now been contained. Officials say only people living in Huntington Chase should be effected.